Unleash! 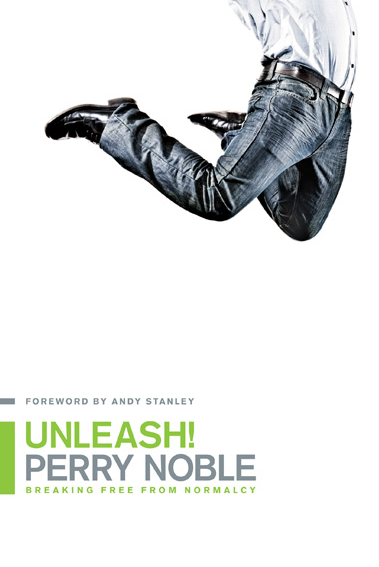 Breaking Free From Normalcy by Perry Noble combats what many of us in the Christian life most often settle for, normalcy. Noble hits a nerve of those in the church that most don't touch. He speaks to the mundane Christian that goes through the motions of life and treats their relationship with Jesus the same. Noble says, "As human beings created in the image of God, we are overflowing with unlimited potential, fueled by His limitless power, yet we choose to cruise through life tinkering with the radio and the mirrors, never discovering who God has called us to be. In other words, we never live a life that is truly unleashed." Every page and chapter in this book is packed full of examples of how to truly embrace Jesus and unleash your life for him. Noble writes, We focus on what's normal when God has promised He is 'able to do immeasurably more than all we ask or imagine' (Ephesians 3:20). Noble asserts that most of us have a small view of God, which results in a small view of what He wants to do in and through us. Throughout the book Noble looks at the life of David who he points out God was seeking to unleash to do greater things than he could have ever imagined. Noble shows how the same is true for us if we allow God to truly unleash our lives. The problem, as Noble points to, is that often times we are wasting our lives by celebrating the crap in them instead of God's goodness in them. Noble shows how one of the main reasons that people get stuck in normalcy is that they will not let their past die, which then will not let them live. People get stuck in allowing their past mistakes and failures to define them but through Christ we are completely forgiven and can be unleashed to re-define our future. Most of us if we are completely honest have bought into what Noble calls "the Great American Lie." The idea that you can do anything or be anything if you just believe in yourself. The truth is that God wants to do immeasurably more than all we ask or imagine. Another problem is that "we stand around 'waiting on God'-wanting great things to happen, yet refusing to take the initiative to actually do what the Lord wants us to do." I believe that most people in the church will find this book to be a wake up call out of normalcy, a very necessary one. It is time for all believers to be unleashed just as David was unleashed in order to allow God to do greater things in us as individuals and as the church than we could have ever imagined. Noble has given us that wake up call that the church needs. After reading this book, I highly recommend it as Noble leaves me with a hope that more people sitting in the pews can be awaken (unleashed) to the greater things that God has for them than they have for themselves. It is hard to imagine what our world would look like if all followers of Jesus everywhere were unleashed!